Defendant, please stand. The charge against you is that in 1984-1985 you did deliberately neglect your duty as a family television programme by electing to subject your audience to violence beyond what they might reasonably expect to see at 5:20pm on a Saturday afternoon. In addition, you made your lead character unlikeable, attempting to murder his companion and using threatening, abusive and insulting words and behaviour with the intent of causing harassment, alarm or distress. As a result of your actions, your audience abandoned you in droves, preferring to watch the less violent and upsetting programming on the commercial channel. Do you understand that? Do you plead guilty or not guilty? You may be seated, Doctor Who. Before we begin, may I say a few words? The charges against you are serious indeed. And there can only be one penalty if you are found guilty: cancellation. Are you aware of the severity of the sentence that faces you? And you still refuse a court defender? Very well. We will proceed. Valeyard, you may make your opening speech. Thank you, sagacity. It is my intention during the course of this blog post to prove that the accused, Doctor Who, is indeed guilty of the diverse charges laid against it. I shall be calling on various epistopic interfaces to demonstrate that Doctor Who is too violent to be allowed to continue its adventures in space and time. I shall demonstrate that the lead actors in the programme have failed to connect with audiences. And I will prove that the programme’s ratings have nosedived since the lead actor incarnated in his latest regenerative iteration. In short, I shall show that the complainant, Mr Michael Grade of the British Broadcasting Corporation, is wholly correct in his assertions that Doctor Who requires resting. Permanently. Thank you Valeyard. I take it you wish to call your first witness? Yes, your majesty. I now call Vengeance on Varos. Usher, I think we can dispense with these incidentals lest this trial become even more weary. May we wind forward a few rels? Thank you. I would also like to draw the court’s attention to this scene, in which the Doctor has used deadly poisonous vines to rig a death trap for two of the poorly paid staff of this grim establishment: one Mr Quillam, who I’m told loved birds and animals, and the Chief of Operations, a man whose rotund appearance lent itself well to playing Father Christmas at the orphanage. Please note that rather than try to reason with Mr Quillam and the Chief, the Doctor’s instinct is to inflict premeditated violent death on them. May I also remind the court that the sixth Doctor also takes amusement after he kills Shockeye in The Two Doctors, and at Davros’s hand being shot off in Revelation of the Daleks. A course of conduct that I hold amounts to a distinct lack of compassion and empathy, hallmarks of a psychopath. Doctor Who, do you have anything to say in your defence? The Doctor’s life was in immediate danger. So, you contend that it is acceptable for the Doctor to kill, and then joke about it like some cut price James Bond, providing it’s in the course of saving his own skin? Well, when you put it like that… No further questions. Valeyard, do you wish to call any further witnesses? Indeed I do, light in my darkness. I call Attack of the Cybermen. In this baffling piece of fan fiction, we see a head being shot off, decapitations, hands being graphically crushed, a character boiled to death and another begging for euthanasia. And, for the first time this season, the Doctor picks up a gun and uses it to kill his enemies. The first, but not the last. Is it your intention to argue that the Doctor carrying a gun is somehow a violation of Doctor Who’s principles, Valeyard? As always, your eminence is one step ahead of me. Yes, Attack of the Cybermen is merely the first instance this series. The Doctor uses a gun to shoot up the control room on Varos. He then uses a crystal to create a death ray to assassinate the Borad of Karfel. Again, in six epistopic interfaces of the twenty-second segment of space/time, I believe this amounts to a course of conduct that suggests the sixth Doctor is perfectly ready to resort to violence and even assassination to achieve his ends. Doctor Who, do you have any questions? I don’t think I need to refute the Scrapyard’s so-called evidence. I shall call my own witnesses in due course. Valeyard, do you have anything more to add? I should like to draw the court’s attention to this graph, which shows that at the start of the season ratings were a whisker off nine million, declining to a bare six million after eight episodes. A full third of the audience were so repulsed by the litany of horrors they were forced to witness that they switched over. Valeyard, these ratings are no worse than Season 21’s are they? No, but I do, Valeyard. They look to hover between six and eight million. So Season 22 is hardly a catastrophic dip, is it? If your grace says so. I do say so, Valeyard. Doctor Who, the time has now come for you to mount your defence. Thank you, your honour. I shall now prove that the charges against me were trumped up by persons who shall remain nameless cough Michael Grade cough as a smokescreen for a cost-cutting exercise for the BBC to fund the launch of a new weekday soap opera. My first witness is The Mysterious Planet. As you can see, in this story, which marked my triumphant return to BBC One after 18 months on hiatus, I address and disprove all the charges of violence against me. I direct the court’s attention to this scene, where I point out that a certain amount of graphic detail is unavoidable when you are making an outer-space adventure series. There has always been violence in Doctor Who and Season 22 is no worse. Doctor Who, may I ask to what you are referring when you say “ a certain amount of graphic detail is unavoidable”? Answer the question, Doctor Who. Some savages have just captured a couple of outer space rogues who were talking about blowing up a totem pole. I see. It’s hardly biting the head off a rat, is it? Or watching a man’s hands being crushed into bloody pulp? Or seeing the grisly remains of a human being peering from within a gory platter of pulsing internal organs and begging his daughter for death? It’s just, it seems like you’re trying to excuse Season 22’s excesses by pretending that they’re no worse than Glitz and Dibber shooting some outer-space laser guns. What about this scene in The Mysterious Planet, where a giant robot horribly electrocutes comedy actress Joan Sims? It is not good, Doctor. In this photograph you can see her face bleeding and her veins bursting from her flesh. To be fair, we cut that quite a lot in the actual episode. So you admit that the content of the show is too graphic for a family audience, and you ought to have practised more restraint? Well, we’d got our wrists slapped, hadn’t we? Best err on the side of caution. Your moral bankruptcy revolts me. Erm… Let me call my second witness, Mindwarp. In this story I, erm, well. I’m not really sure what’s going on in it to be honest. It looks like another story where the sixth Doctor goes mad and tries to kill Peri. Ah, yes! But it’s a trick, isn’t it. Isn’t it? Erm… Let me move on to my third witness. It’s a story from the Doctor’s future, a web of mayhem and intrigue where he actually saves the human race! Is it going to be your defence that the Doctor improves? Well, I wouldn’t say that. It’s basically Nightmare of Eden to be honest. I liked Nightmare of Eden. That one with the scarf and the blonde girl were very witty. Ah, well, erm. This one has Bonnie Langford in it. And this is offered as your defence? Doctor Who, is this going anywhere or are you just wasting the court’s time? Um, let’s skip to Part 13. This is Robert Holmes’s last script ever. Ooh, I’m in this one! Yeah, it’s quite clever how they reveal you’re the Doctor, isn’t it? What’s that? He’s the Doctor? Don’t worry about it, your awesomeness. It’s not really important to the plot. Anyway, the location work is excellent and the strange fairground world inside the Matrix promises that this is going to be a climax every bit as memorable and creepy as The Deadly Assassin. What? Ah. Anyway, what was Part 14 like? A triumphant climax that brilliantly paid off the previous 13 weeks? Well, I wouldn’t go that far. But it is quite good. I mean, you find me guilty as charged of all the violence and stuff, but I fiddle with some wires behind the TV and so you let me off. It’s a bit of a lash-up job but to be fair the original writer walked off in the longest sulk in history, and they had to cobble it together on the hoof. What? Are you serious? You spend 14 weeks on a self-imposed courtroom drama that’s meant to put the programme on a literal show trial in front of the viewing public to prove to everyone that the Michael Grade was wrong, and you don’t even have a climax? You show the programme isn’t violent by raising the idea that it’s too violent? You address the Doctor being unlikeable by having four episodes where he goes mad and tortures Peri until her brain is taken over by a giant slug and she gets gunned down? Your defence is that things can only get better? And you don’t even have an ending in mind? And you had 18 months to prepare? What on earth were you thinking? Were you even thinking? I mean, fair enough you introduced the sixth Doctor as the antidote to the fifth. Although even then, that’s solving a self-made problem. You made Peter Davison’s final season a damning indictment of the fifth Doctor’s basic niceness leading to prevarication and ineffectiveness. He had to “mend his ways” because “ it’s stopped being fun” – but that’s because you stopped making it fun. And your answer to that is the sixth Doctor, a man whose coat is the most likeable thing about him. A man who’s willing to kill to save the day, but only when it’s already too late and pretty much everyone’s already dead. A man who smirks about the people he kills. A man whose relationship with his companion is distressingly close to domestic abuse: poor Peri, cowering and feebly trying to defend herself as the Doctor bellows in her face. You do all that, and you claim it’s all part of some massive master plan, to make the Doctor mellow with time? But why did you make him so awful to start off with? Just, why? It’s September 1986. Doctor Who has been off the air for 18 months. The Trial of a Time Lord is its chance to disprove Michael Grade’s comments that it has become overly violent with farcical storylines and low ratings. 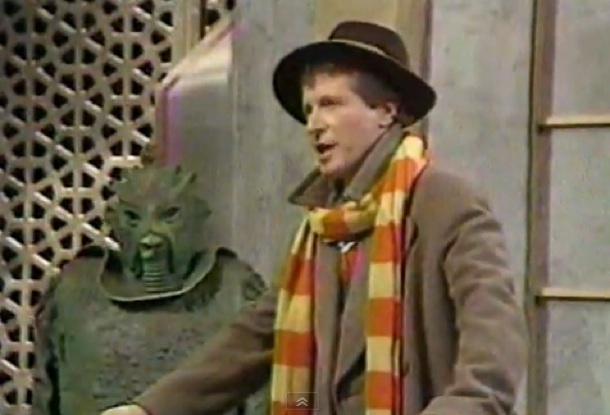 And for a more sensible view of The Trial of a Time Lord, visit this article on my main blog. Next Time: “Is it going to be the Doctor’s defence that he improves?” Time and the Rani.